Dubai – UAE; 27 October 2016: For the first time ever, Sami Yusuf will hold a one-off concert in Dubai on 16th December at Dubai Opera. During the evening, Sami Yusuf plans to premiere a very special song called ‘Glorification’ which is inspired by the beautiful poetry of HH Sheikh Mohammed bin Rashid al Maktoum. Now on his eighth album “Barakah”, Sami Yusuf has already sold more than 34 million albums across the last 15 years. 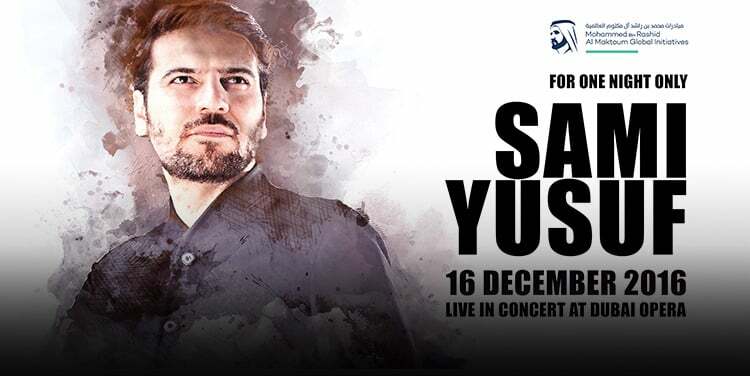 Having never before performed in Dubai, this concert promises to be an occasion to remember as Sami’s positive messaging for peace and harmony, which is woven throughout his lyrics, resonates and unites music fans from across the globe. Speaking at Dubai Opera, Sami Yusuf said: “I am so delighted to be performing my very first concert in Dubai and even more so at the beautiful and prestigious Dubai Opera. Dubai in many ways represents the philosophy of my music, Spiritique, that of bringing together people in celebration of our shared values, free from discrimination and prejudice. I am honoured to have this opportunity to unveil a new musical composition based on the poetry of His Highness Sheikh Mohammed bin Rashid al Maktoum. I look forward to seeing you at the concert on the 16th of December and at the rehearsal the day before for those who choose the special ‘add on’ option when buying tickets”. Tickets go on sale at 9am on 27th October 2016, priced from AED 350, available to purchase from Dubai Opera website. There is also a special behind the scenes ‘add on’ option for concert ticket holders, with an exclusive opportunity to join Sami Yusuf behind the scenes the day before as he prepares for his first ever concert in Dubai. An intimate 90-minute rehearsal and opportunity to meet one of the most successful singer-songwriters, composers, producers and multi-instrumentalist of the Middle East.